The Akiles WireMac Wire Binding Machine binds using what’s often referred to as a spiral wire or double loop wire. Wire binding provides a very professional look while providing a practical approach to document finishing. The Akiles WireMac Wire Binding Machine has a 20-sheet single punching capacity and a 14″ width capacity with open sides and a punching guide that allow you to punch even wider documents. Any and all of the dies can be disengaged, meaning you can also punch smaller documents without worrying about partial perforations at the top and bottom ends of your document. The WireMac works just like any other wire binding machine, simply line up your document using the guides, punch your perforations, load your wire coil and insert. It’s simple, intuitive and quick. The best thing about this machine is its sturdy construction and overall durability. If you’re looking for a portable table top binding unit that still has some heft and substance to it, this is it. 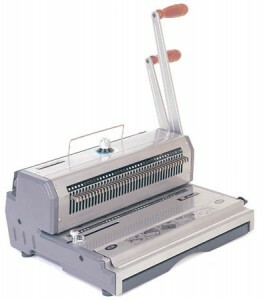 The Akiles WireMac Wire Binding Machine costs $349.95 at Lloyd’s and comes with a 1-year warranty from the manufacturer. You can opt to purchase an extended warranty from Lloyd’s of Indiana for 15% of the purchase price for a 2-year warranty or 20% of the purchase price for 3 years. If you exclusively bind documents using double loop wire binding, the coil mac is a good machine for you. it is durable for a wire only machine. It can handle most jobs.